EXCLUSIVE! 40% off Photobooks & 30% off all other products! 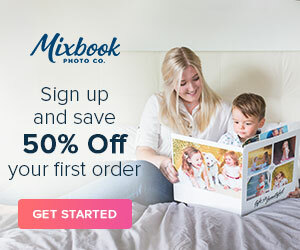 50% off your first order from Mixbook! Check out Mixbook's Free Digital Scrapbooking Backgrounds and Clip Art! If you like digiscrapping, lots of flexibility with layouts and cute clip art, you'll love Mixbook! You'll have hundreds (maybe thousands?) of options with backgrounds and stickers - all FREE! You'll also see the latest Mixbook Deals! Check out my Mixbook Reviews here! Looking for a Groupon deal? If it's running today, you'll see it on our Groupon/Living Social Tracker page. Click on the link or the blue button at top right! Check out Mixbook's free software here, packed with tons of free clip art and backgrounds. Also don't forget to check out the Coupons & Deals page. 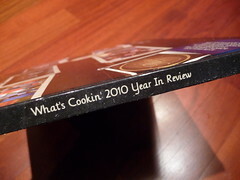 The first time I reviewed Mixbook was back in 2011. Since that time I’ve gone on to make several books with Mixbook and over the years the company has expanded its photo book product lines as well as added other custom photo products such as canvas prints, cards, calendars and prints. This year, (2016 as of this update) the company celebrates its 10th anniversary. It seemed a good time to refresh this page and update my overview of Mixbook. What hasn’t changed is Mixbook’s focus on collaboration. If you’re looking to work on a photo book project with a friend or family member, Mixbook’s software really lends itself to a collective project. A group of users can individually log in to work on a single photo book project together, easily sharing photos and creative ideas. This could be a fun joint activity for a club, family or group of friends. You can also share your photo books online for free even if you don't print your photo book by embedding the Mixbook player on your website or blog. 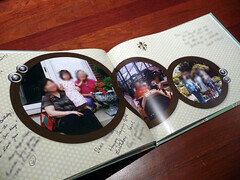 Images of the photo book guest book I made with Mixbook are at top right and the group cookbook project are below. I found the program very easy to use and everyone loved their books! Mixbook offers both hardcover and softcover books in 7 sizes ranging from 8x6 to 14x11. 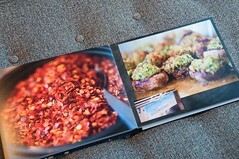 Format options include square, landscape and portrait books. Lay flat hardcover photo books are also available, printed on a thicker and different type of paper than its regular photo books. 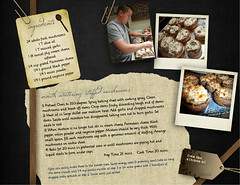 Check out my Mixbook lay flat photo book here. With Mixbook, you don’t need to download any software as the book building process occurs online. Both Macs and PCs are supported. A real stand out with Mixbook’s software is its user-friendliness. But even though it’s easy to use, it’s packed with a lot of advanced design options and all the main tools you’d look for in a layout program. 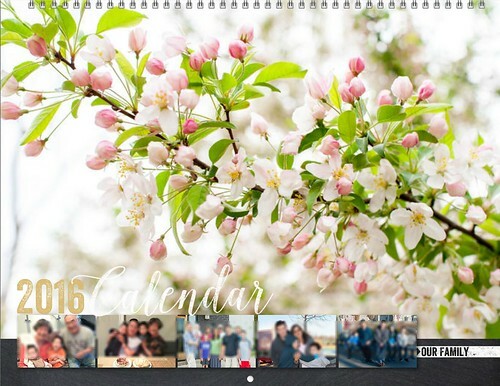 There are a good variety of layouts and backgrounds available and you can also create your own layouts. For those photobookers who enjoy adding a lot of design elements such as clip art and other enhancements, the well-designed backgrounds and stickers really give Mixbook that scrapbook-look. There are also more than 300 themes to jumpstart creativity so there’s no need to start from scratch. 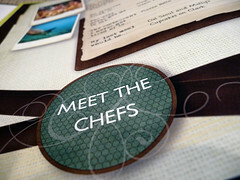 For the more advance digital scrapbookers, the software allows you to upload your own embellishments. If you are a traditional scrapbooker and just getting into the digital world (like I was years ago), Mixbook is a great place to give digi scrapping a try. 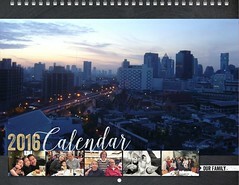 The flexibility of Mixbook’s software extends to its other products namely the custom calendars and cards. 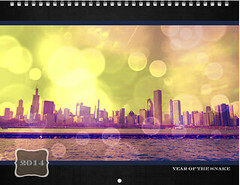 I make Mixbook calendars every year for my family using all those forgotten photos from the past year. This year will be my sixth year making Mixbook calendars for my family. It’s become a family tradition and it’s a gift that is eagerly anticipated every holiday. What’s very helpful and a time-saver is that all of my family birthdays and special occasions are automatically saved so I don’t have to reenter them each year. I make my calendars every year with Mixbook because of the user friendly software and because of the high level of customization it allows. 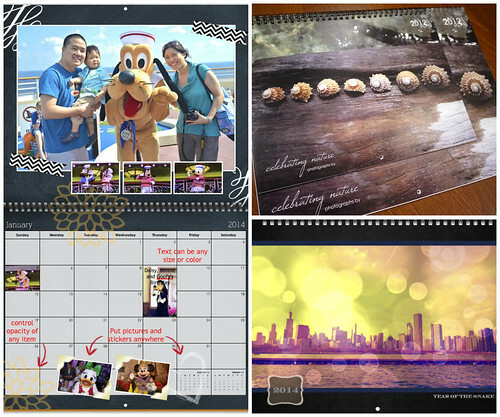 Most calendar products by other companies are very limited in layout and restrictive as to where you are allowed to place photos. I don’t have those limitations with Mixbook. Same goes for their custom cards. I like that I can start with a card design that I like and then tweak in virtually any way that I wish. Mixbook frequently offers discounts and coupon codes on their photo books and other custom gifts, which you can find by clicking on the green button at the top of this page. Not only can you give your photo a frame in any color, you can also add a shadow or reflection for your photo or clip art which is not a common feature. You can adjust the transparency of a photo and place a photo into a variety of adjustable photo box shapes such as circles, triangles, stars, hearts etc. 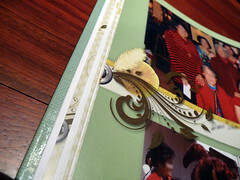 Images and embellishments can cross over a two-page spread - an uncommon feature in other photo book companies. You can customize the book spine with a title. All of the fun clip art, backgrounds and digital scrapbooking elements shown here in the books I created, are free within the Mixbook program. Want to see my detailed review and how I put together my group cookbook project? Check out my detailed Mixbook Review. 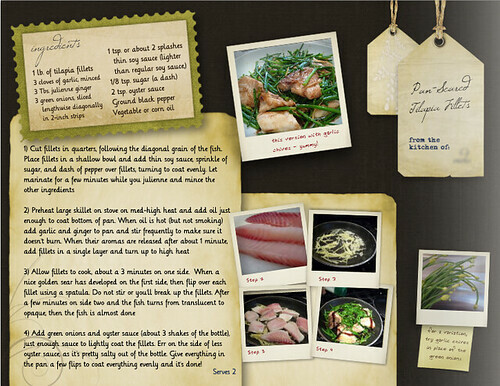 The next two screenshots are of my group cookbook that I worked on with friends. All clip art shown is free within the program! 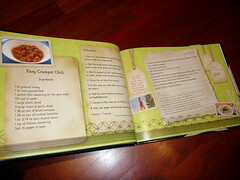 Learn how to make your own cookbook! Click HERE to go to Mixbook's site! Don't forget to check the main Photobook Deals page for all of today's deals! Bookmark that page or fan me on Facebook and you won't miss out on the latest coupon codes! Save money with the latest Mixbook coupons and deals, or see if there are any Mixbook groupons. Apr 28, 2018: Mixbook Mother's Day Giveaway Winners Announced! Mar 22, 2017: Winners Announced! 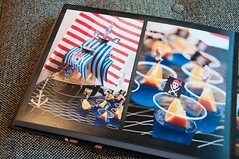 One Year of Free Photo Books 7th Anniversary Giveaway & An Exclusive Mixbook Deal! Dec 12, 2016: (EXTENDED 12/19/16) Photo Book Girl's 5 Days of Mixbook Deals & Holiday $200.00 GIVEAWAY! Nov 21, 2016: My Custom Holiday Cards with Mixbook & FREE Card Offer for PBG Readers! 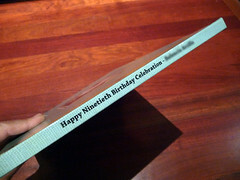 Mar 10, 2016: 6th Birthday Photo Books For a Year From Mixbook Winner Announced! 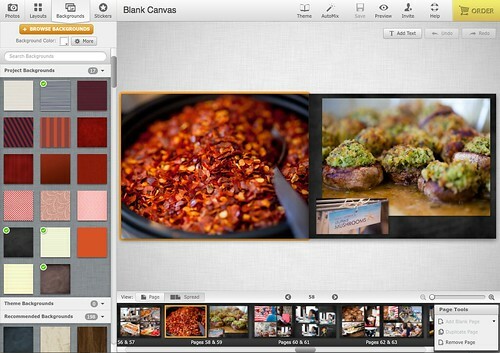 Thinking about designing a photobook on Mixbook? 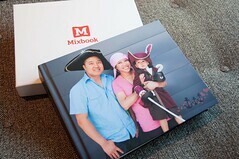 You can view a detailed chart of every Mixbook photo book, including sizes and pricing. 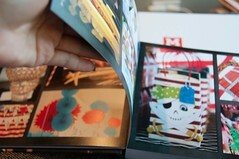 See the full list of Mixbook photo books.